I was just like, ‘Hey I want to look like a girl. People are going to think I’m a little boy on the screen.’ I remember that kind of sunk in. I was watching back some playback and I was like, ‘You look like a dude.’ And I just wanted some lovely dresses and some corsets and to look like a lady. And then I just went and did this film, which is based on Mary Shelley’s early life. I was running around with Elle Fanning in a corset. I did that for three days. And--oh my god--I’m going back to the trousers straight away. It wasn’t for me at all. If you are looking at Game of Thrones from a fashion perspective, Dany has gotten to wear some great dresses as she has moved from city to city, conquering the towns but also their fashion sensibilities as she went. Sansa has worn some pretty gowns, too, especially during the two episodes where she got married. The Sand Snakes have their own cool costumes thanks to the fashion sensibilities in Dorne. But poor Arya wore grody, dirty clothing as she traveled under the guise of being a boy. Now that she’s in Braavos, she’s dressed more like a girl, but she’s essentially wearing sacks. So it’s easy to see why she might be a little jealous of the costumes the other actresses get to wear on the set of the fantasy drama. Obviously, however, there are cons along with the pros. Although Game of Thrones is technically set in a fantasy world, a lot of costumes are tight and reminiscent of period dramas. So, it’s not a huge surprise that Maisie Williams is rethinking the sack look now that she’s had to run around in a corset. If you’d like to hear some more amusing stories from the Game of Thrones actress, do give the full interview a watch, below. 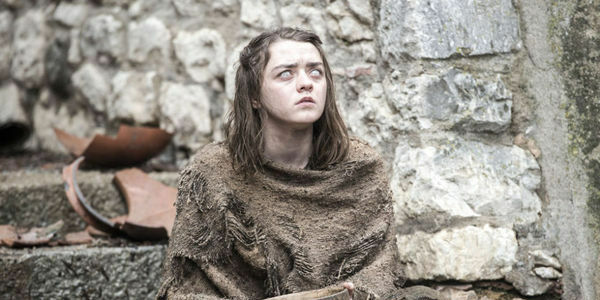 Luckily, if you like the sack look on Arya, you won’t have too much longer to wait to catch the actress back in action. Williams also notes in the interview that the character is in Season 6 a little less than usual, but her storyline is more streamlined, so I can’t wait to see what that means. You can catch new episodes of Game of Thrones when the HBO drama returns to the schedule on April 24 at 9 p.m. ET. In the meantime, you can see everything we know about the upcoming drama, here.